It seems like such a long time since I have done a monthly update here at More Dividends. In reality, I only missed the month of November and for that I apologise. In the future I will be more consistent with my post here on the blog. I hope that everyone had a great Christmas and New Year. It is always a blessing when we get to see another year! The market has been reaching new highs everyday and that is amazing. During this time though I haven’t been adding a lot of new capital. I have strengthened a couple of positions and all of the other work has been done by reinvesting my dividends. So let me jump right in and break down how my month of December has been going! During December, I didn’t open any new positions but I did add to some of my existing positions in my Portfolio. This will add $14.01 to Dividend Income for the year. December became my highest paid month, with just a little over $50 paid in dividends during the month. 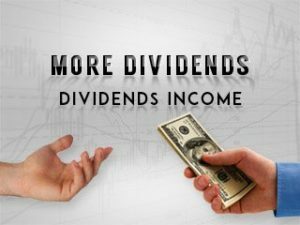 December is one of my strongest months for dividends paid! 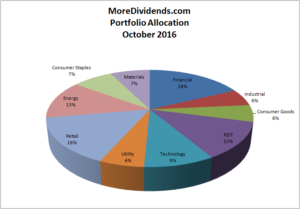 December was the last month of Q4 and accounted for $50.12 of my 2016 Dividend Income. It is always nice to get a raise for doing absolutely nothing. Even though they were small raises they will still add to the snowball! It is amazing to see the changes that have happened in my portfolio as far as the allocation of capital is concerned. With Bank of America stock stock rallying, it has led to a large increase in my allocation in the financial sector. I am ok with this for now. My portfolio is near its all time high currently. These are things that I cannot control since the market has been on such a rally lately. I will continue to add capital when I see fit. Here are the articles that I posted on here during December. These articles were slipped in right at the end of the month but in total I published 2 articles on the blog this month.. The Disappearing Act Is Over! It has been a busy time of year and I loved every minute of it but I am also glad that it is over with. The beauty of having a good working dividend stock portfolio is that it will keep producing money for me while I am off making me money somewhere else. In time, my portfolio and income will continue to grow. I would love to see some more buying opportunities come around so that I can deploy some new capital into the portfolio. Until that happens, I will continue to look for more ways to put my money to work for me. I look forward to being more active here on the blog and in the community in general. I can’t wait to reconnect with some familiar people and to meet some new ones. Until then happy investing. Well done for 2016! 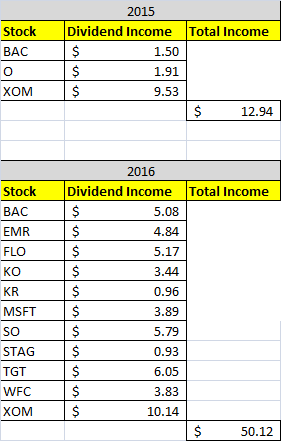 Your progress over last year is impressive, both in the number of companies and the dividend income received. If you can keep this pace up the net-worth snowball will really be rolling in no time. Thank you. It has felt slow so far but it really fells like my snowball is starting to pick up some momentum now. 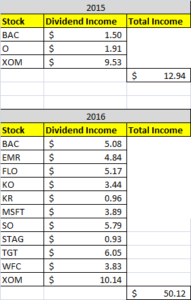 Overall a nice summary of dividend income and I like the stocks you have been adding too. I am still considering STAG for my own portfolio but am focused on the health REITs more so these days as they all have been beaten down silly over the last couple of months. Keep that dividend income growing. Look forward to following you in ’17! It’s good to hear from you DH, thanks for stopping by. I added some to my OHI holding, a little bit ago to lower my cost basis. I am still looking to add more to my STAG position as well. I am curious to know what healthcare REITs that you are watching? The health REITs I’m watching are HCP, CCP, LTC and to a lesser extent HCN, VTR and OHI. Before I made my purchase of OHI, I had considered HCP. It seemed like a lot of uncertainty for me because of HCR ManorCare…. but I know that they have spun that off into it’s own company now. It is definitely an interesting sector right now with some bargains out there. Congrats on a great month and some really impressive year on year growth. Looking forward to the success in ’17. 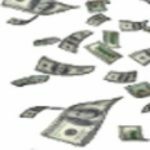 I’ve included your monthly income in my monthly dividend income tracker. Thanks for stopping by PS. Yeah, I am just hoping I can continue that kind of growth going forward. I appreciate you including my dividend income into your tracker. I look forward to reading the article!